Pawn your Diamond Ring! We offer Loans on Diamond Rings! If you’re the proud owner of a timeless piece of jewellery, you’re probably wondering ‘where should I pawn my diamond ring in London?’ There’s a lot to consider when trusting your valuables to a pawnbroker, and making sure the premises you choose is trustworthy and reputable is essential. Here at New Bond Street Pawnbrokers, our team of experts is highly experienced in handling a wide range of jewellery, including diamond rings. We’ll properly care for your valuables and appraise them accurately so that you can find the fairest price. Our goal is your ultimate peace of mind and satisfaction. To get started on securing loans on diamond rings at our award winning Central London pawnshop, contact us for a no-obligation consultation. If I pawn my diamond ring, how much could it be worth? Diamonds are arguably the world’s most famous and desirable precious stones. They’ve been used decoratively for thousands of years, making any kind of diamond jewellery a real classic accessory. Diamonds are priced according to the ‘four C’s’, which are carat, clarity, colour and cut. Although diamonds are always considered a luxury and are typically high in price, value varies widely depending on the gem’s quality. 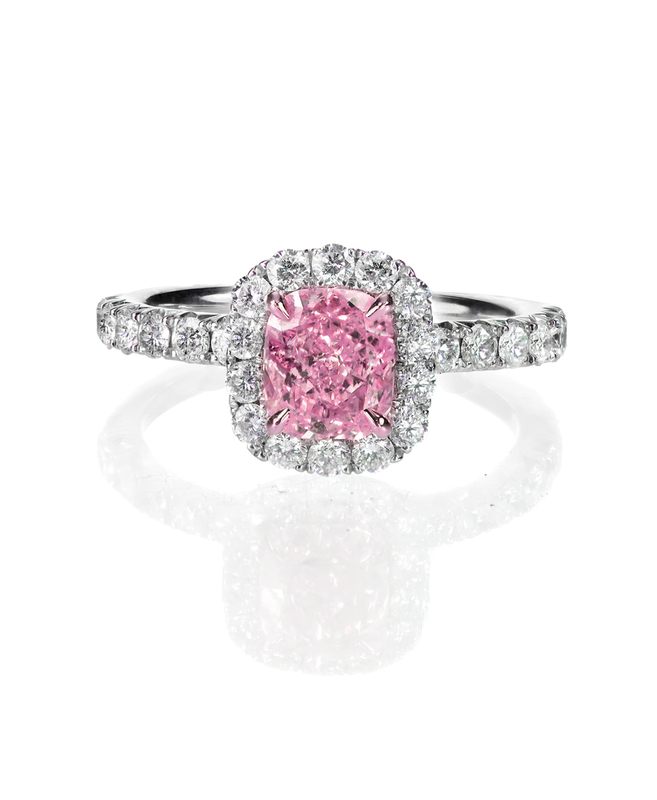 In 2018, the world record for the highest priced pink diamond (per carat) at auction was broken. It was Christie’s that sold this particularly rare piece, a diamond named ‘The Pink Legacy’ that went for more than $50 million. Boasting 18.96 carats and exceptional purity of colour, it’s a much sought-after collector’s piece. However, diamond rings that are smaller than one carat can be purchased for less than £600, meaning it’s essential your piece is valued as accurately as possible by professionals. To make the most of loans on diamond rings, book an appointment with New Bond Street Pawnbrokers and avoid losing out. Is there anything I should know before I pawn my diamond ring? When estimating the value of your diamond ring, it’s beneficial to know more about how the ‘Four C’s’ affect the amount your piece can reach. Colour: Diamonds that are completely colourless are particularly rare, as light passes through them more easily, which results in a more vibrant, sparkling effect. Most diamonds that appear colourless actually have varying shades of white or yellow within them. If a diamond is noticeably coloured, for example in green or blue, then it’s likely to be very valuable and rare, similarly to completely colourless stones. Cut: An expertly cut diamond reflects light at a much more effective angle than one that is poorly cut, making the gem much brighter. Classifications range through from ideal, excellent, and very good to good, fair, and poor. Clarity: The majority of diamonds will have flaws, which can take the form of blemishes or inclusions. Blemishes are surface imperfections, taking the form of scratches and chips, and inclusions are deeper within the stone, which include air bubbles and impurities. The higher the clarity of the gem, the greater the value. Carat: A carat refers to how much a diamond weighs, and larger diamonds are often valued at higher prices. However, ultimately it is a combination of all the above factors that determines a piece’s final price. So, if you are looking an appraisal or loans on your diamond rings, contact New Bond Street Pawnbrokers to make a no-obligation appointment. Our experienced team will be able to explain why your ring is valued at a certain price and assist you with securing a loan against your jewellery. With our service, there are no hidden costs and minimal paperwork, offering you the most efficient transaction possible. For more information on services provided by New Bond Street Pawnbrokers please watch our video here and read about the loan process here.